Governor of Akwa Ibom state, Udom Emmanuel, has called on Akwa Ibomites and Nigerians to hold on to the culture of peace. He made the call at the Catholic Diocesan New Year Fasting and Prayers Thanksgiving Mass which held at Cardinal Ekandem Seminary grounds, Dominic Utuk Avenue, Uyo. 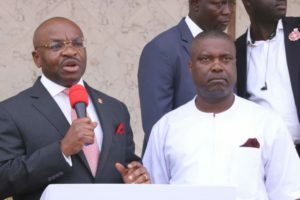 The event was attended by the state’s past and present governors, the governorship aspirant of the All Progressive Congress (APC), Nsima Ekere and other politicians. “I want to thank God for the peaceful coexistence of people in Akwa Ibom State and for the peace we are enjoying in our state today. It is because we have so many Christians praying for us, that is why we are enjoying this peace, stability and development. “At the end of the day, it is not about us, it is about the soul of this state, it is about the destiny of this state. Whatsoever we do today is about the destiny of Akwa Ibom State, it is about the future of our children. We are for sustainable development which involves preparing our children for the future and also preparing the future for our children.” Emmanuel said. The governor cautioned that politics is not meant to breach the harmony and unity that exist in the state, expressing confidence that prayers would bring an enduring peace and ensure a credible and violence-free election in 2019. In a public display of love and brotherliness, the Governor embraced the governorship candidate of APC at the chancel, in a move which delighted the congregation. 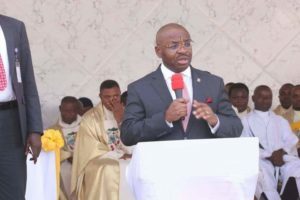 Catholic Bishop of Uyo Diocese, John Aya, thanked God for the good leadership provided by Governor Emmanuel in Akwa Ibom State, adding that Emmanuel’s kindness has extended to the church and the people of the state. “We will continue to thank you for the good work you are doing. If you were doing badly, you know me, I will tell you that you did it wrongly. That is why we are appreciating you. We ask God to bless you for all the good works you have done,” the Bishop said. This entry was posted in Christianity, News, Politics, World and tagged 2019 Elections, Akwa Ibom, APC, Nsima ekere, PDP, Peace, Udom Emmanuel. Bookmark the permalink.